When you think of a sunset, do you feel a bit sentimental? Perhaps a bit sad that a particular sunsetting device or piece of technology will soon become obsolete? Admittedly, that’s just the way things go. With a rapid succession of technological advancements, it becomes impossible for any company to continue to support older technology indefinitely. At some point, the decision is made to let go of older technology that has served us well and fully embrace the next technological wonder. So, why are we bringing this up? You may have heard that Verizon is discontinuing its support for 3G devices at the end of 2019. Telstra in Australia plans to do the same in 2020. 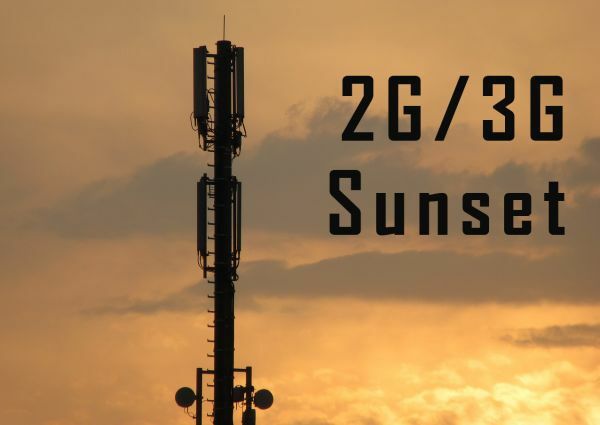 In preparation for these sunsets, these carrier networks are no longer permitting 2G and 3G activations. Moreover, it has been commonly speculated that other cellular network providers will discontinue their support for 2G and 3G devices sooner rather than later. Obviously, you don’t want the transmission of your valuable measurement data to be impeded by a technology gap where the devices you’re using don’t support 4G LTE technology. (We don’t want that to happen to you either.) Consequently, to keep up with the technological times, we are highly recommending that our customers with 2G and 3G modems upgrade to 4G devices—so you can continue to reliably transmit your data. The CR300 Datalogger has a -CELL205 option (suitable for non-Verizon networks) and a -CELL210 option (specifically for Verizon networks). Similarly, the CR310 Datalogger with Ethernet offers a -CELL205 option (suitable for non-Verizon networks) and a -CELL210 option (specifically for Verizon networks). The CELL205 is a 4G LTE CAT1 external cellular module designed for you to use with AT&T networks. The CELL210 is similar to the CELL205. It is also a 4G LTE CAT1 external cellular module, but you can use it with Verizon networks. The CELL215, similar to the CELL205 and CELL210, is a 4G LTE CAT1 external cellular module. The CELL215, however, is designed for use with cellular networks in EMEA countries. In the future, we will offer a CELL220 cellular module that is designed specifically for the Telstra carrier network in Australia. Review your equipment to determine how many devices need to be upgraded. Determine which Campbell Scientific option will best meet your needs for the future. If you need help deciding, contact your favorite Campbell Scientific sales engineer in our U.S. office at 435.227.9120. Order the equipment you need. Plan when and how you will swap out your communications devices. Until technologies such as 5G are fielded, trialed, and scheduled for scaled deployment (sometime after 2020), 4G LTE technology will be the primary technology supported by the major network carriers. It is our estimate that 4G LTE technology will be the standard for at least the next 10 to 20 years for fielded applications and installations. Sunsets can be sad, and change can be difficult. (We know.) But denial of what’s coming won’t prevent it, so we’re trying to make the transition as painless as possible for you. Credits: Gary Roberts, Product Manager over communications and software products at Campbell Scientific, Inc., contributed to this article. If you have questions or concerns about this transition, post a comment below. The CELL215 is now available at www.campbellsci.com/cell215.